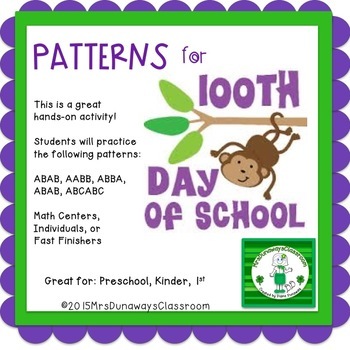 This hands on activity for patterns ABAB, AABB, AABB, ABCABC. It's perfect for preschool, kindergarten and first grades. Page 1: Cover Page -- I like to cut this out and glue or tape on the front of a 9x12 or 10x13 manila envelope and store all the materials inside. 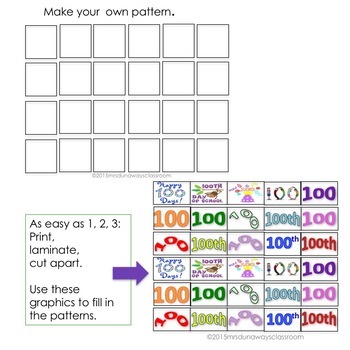 Page 4: Pattern Mat; copy on cardstock (in color) and laminate. 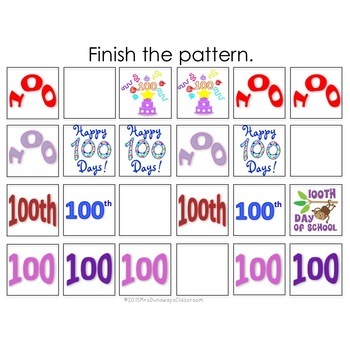 Students will use manipulatives on next page to complete the next two objects in each pattern. Page 6: Make your own pattern. Copy on cardstock and laminate. Students use manipulatives to make their own patterns. 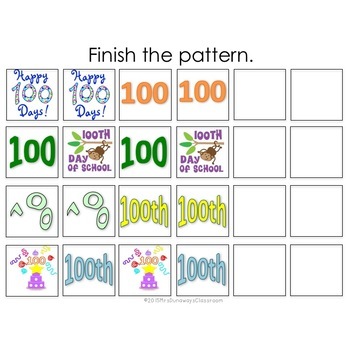 Page 7: Manipulatives for Patterns. Copy on cardstock, laminate and cut apart each graphic. Store in a ziploc bag with the pattern mats. Page 8: Thanks for downloading this product. ©MrsDunawaysClassroom All rights reserved by author.